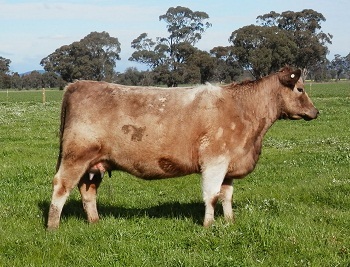 Delvene is one of few calves by Fandango. A heifer's first calf, she is displaying the traits we are after: a low birth weight great growth. Her birth weight EBV is in the top 5% of the breed, her IMF along with all her $ indexes are in the top 10%. She has produced a lovely calf to Gandalf RGN G9. This graph is based on January 2018 update. Click here to view most recent Breedplan data.